The hotel is located very close to the city centre, it is surrounded by parks, cycle lanes, and it is a-few-minute-away from the sandy beach. There are many faciclities for families with children… Hotel Sopot**** is an idyllic place for a family holiday on Baltic Sea coast. Warm interiors, which have been made of both wood and copper, create an inimitable design. Your business meetings, conferences and banquettes will be beefed up thanks to the modern architecture, which will also affect your family events, which will glitter because of it. A modern and cosy style of the rooms which have been made of the highest quality of the materials provides comfort and relaxation. Their suites along with the spacious terraces are pearls in the quality they serve. ,,The spaciousness of the rooms is my favorite interior element. Everything what you need to happiness, you can find near the Sopot Hotel. One of the longest wooden piers in Europe – its length: 511,5 m. Not only is a lighthouse with a viewpoint to be found here, but also a summer cinema and an ice rink in the winter. The pier is one of the busiest tourist sights in this area. There is a marina at its end. However, entrance is not free of charge during season time, many people take advantage of being able to go for a walk, thus it is a peculiar viewpoint. The Gulf of Gdańsk, Tricity coast and the city itself might be admired from here. The land part (Treatment Square) is a square with an area of 20 thousand square meters, mass events for up to 6 thousand people can be organized here. Summer cinema can be spotted here in the summer, yet artificial ice rink in the winter. The wooden part (walking) is an ideal spot where its walkers are attracted to admire the panorama of Sopot. Apart from the main pier (511,5m from which 458 m surfaces with the Gulf of Gdańsk), there are lower decks and a side deck which enable passenger ships (such as Ship Pirat from Gdańsk and a ferry to Hel) to anchor. Since 2011 there has existed a yacht marina which can hold up to 100 yachts in season. The weirdest building in the world which can be spotted in the center of “Monciak” has become the visit card of Sopot and undoubtedly a must when it comes to visiting Sopot. Not only does the fabulous building, which has been inspired by the drawings of Jan Szancer, draw the visual attention of its visitors, but also mental. Traditionally, people who take part in cultural events place their signature on the walls of ,,Krzywy Domek” (Crooked House), which are called “The wall of fame” and serve as a Polish mirror of the American Hall of Fame. This one of the many extraordinary ideas of its creators, which have been made real, was the reason why this building was nominated to the contest of the new 7 wonders of Tricity in 2009. It was greatly renewed by the internet users and got really famous. Crooked House gets really vibrant in the evening. The clubs and pubs here guarantee a wide scope of events. The high quality and diversity of the cuisine will be found hugely appreciated by the more sophisticated and also more traditional tastes. 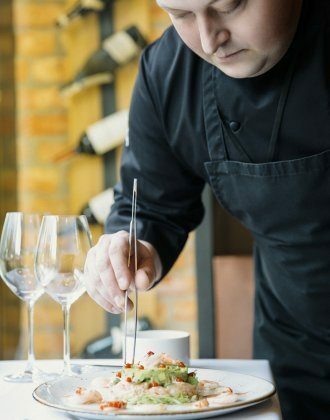 Cuisine is a real kingdom, with top chef Jacek Faltyn as its sole ruler. No compromise and no short-cuts are allowed. He will gladly advise you in selecting a menu for important events. You can also see him every morning, when he personally oversees the service and the quality of the breakfasts (in the form of an extensive buffet, full of complimentary flavours). Your relaxing stay in Hotel SOPOT can be more attractive though wide range of additional activities. Our SPA is an unique place helps relax your tired body and calm the senses. We have prepared a variety of treatments whose professional preparation will help you get the perfect form and the skin condition. The sauna and relaxation zones allow you to unwind while at the same time strengthening your immune system. The fitness room is packed with high quality equipment, allowing you to stay fit and healthy. If you love active vacations, we have many outdoor activities available. The parade of tastes and scents at Restaurant No. 88 will make you recognize it and dare to return to it subconsciously. Extraordinary interior encourages to organize culinary family and business meetings at the highest level.